Dover, Del. 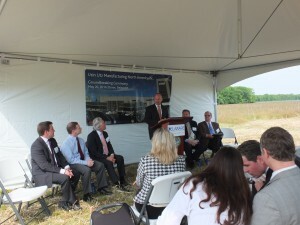 (May 20, 2014) – Germany-based flooring company Uzin Utz AG broke ground on its first U.S.-based dry mortar plant Tuesday, adding to its 113-year legacy of success while also contributing to the bright future of manufacturing in Delaware. Gov. Jack Markell, Lt. Gov. Matt Denn and Alan Levin, Director of the Delaware Economic Development Office, joined company officials in a ceremonial moving of the dirt at the future site of the 53,000-square-foot facility, which will anchor the Garrison Oak Technical Park in Dover. Gov. Markell thanked Dr. Werner Utz, Chief Executive Officer of Uzin Utz, and Philipp Utz, President of subsidiary Uzin Utz Manufacturing North America Inc., for choosing Delaware as the site for their expansion. Founded by Georg Utz in 1911, Uzin Utz AG is a family-run company that specializes in professional installation systems for all types of floor coverings, leveling compounds, damp-proofing systems, adhesives for textile, resilient coverings and wood flooring. Once complete, Uzin Utz’s 53,000-square-foot plant will also house a research and development center and an application area for testing and customer training. Uzin Utz was awarded a Delaware Strategic Fund Performance Grant and a Capital Expenditure Grant, and plans to create 23 jobs at its new facility in Dover. In addition to Uzin Utz, Garrison Oak Technical Park will also soon be home to The Garrison Energy Center, Calpine Corp.’s 309-megawatt combined-cycle electric generating facility, which will enhance reliability for Delaware and the regional power market. The facility is slated to be ready for commercial use by June 2015. Since its foundation in the year 1911, Uzin Utz AG has developed from a regional adhesives manufacture to a globally active full-range system supplier for flooring systems. The family-run business, currently in its third generation, and its some 900 members of staff are leading in the development and manufacture of special products and machinery for floor treatment. With their long-standing experience and the comprehensive flooring competence of the product brands Uzin, Wolff, Pallmann, Arturo, codex and RZ as well as the advisory service UFloor Systems, the company offers its partners practice-oriented products, systems and services for the installation, renovation and value maintenances of floors of all kinds. The company’s subsidiary, Uzin Utz Manufacturing North America Inc., was founded in 2012 and will be located in Dover, Delaware, when its new dry mortar plant and research and development facility are built in 2015. Visit www.uzin-utz.ag.